Show Review – Fedora Upside Down Reunion Night “Gypsy’s Know How to Party! Fedora Upside-Down was once an impressive array of urban folk artists from downtown Toronto that banded together for a sense of community and support. Coming from a huge variety of cultures Fedora Upside-Down threw legendary parties across the city of Toronto. Having separated a few years ago Lemon Bucket Orkestra decided to organize a reunion and I have to say that they have not lost their touch. Delivering unique and high class folk music. This was the first of a two night mini festival. The night started with the mystical Sephardic, Klezmer, Balkan stylings of Ventana’s. They featured an Oud, flamenco guitar, staccato violin and two fantastic percussionists. They were also all invited back up on stage about half way through LBO’s set. Lemon Bucket Orkestra was the clear stand out of the night, each song somehow delivering more vitality than the last. My only complaint is that there were some technical issues with the violin, but with so many instruments in play little slip up here and there is ultimately forgivable. This was one of the best nights of music I have seen at Lee’s Palace. There were points in the night when my job literally dropped. A motley looking crew, Lemon Bucket Orkestra seriously needs to be on a huge festival circuit tour opening for Gogol Bordello. They look like a travelling carnival, so it is not surprising that they started as a busking collective. They are hands down Canada’s best eastern European party band. 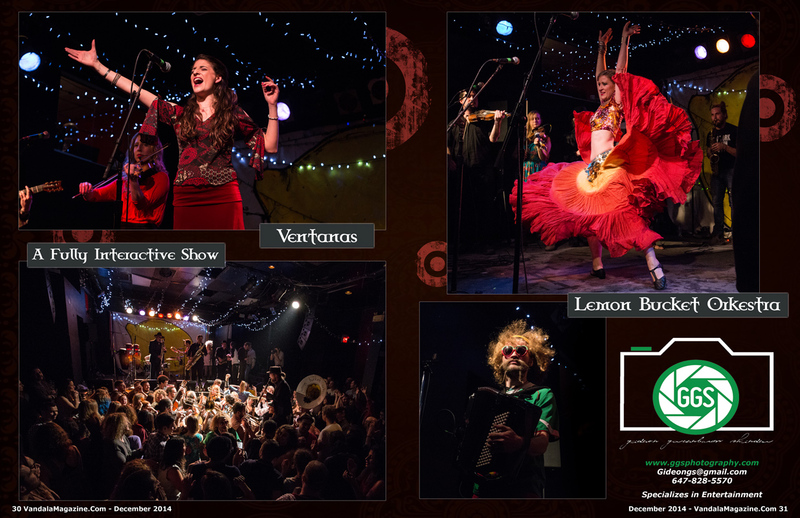 Combining a overflowing array of Balkan, Klezmer and Gypsy styles tempered perfectly with a boisterous punk rock attitude. They are true entertainers featuring so many artists that I won’t even try to name them all. They also have a belly dancer on stage for most of their set. There was a practically primal reaction that they got out of the audience. They are completely electric and raw on stage, overall, a pleasurable spectacle that it was hard to take your eyes off of. I actually had the pleasure of being billed alongside LBO about four years ago at Toronto’s El Mocambo with on old band. It was still a great time being in the audience of one of their shows back then, however, now they have truly skyrocketed to a totally different strata of both music and entertainment. The show ended with the dozens of performers on stage pouring into the audience for another full three songs, corralling and frenzying with the crowd. The night was capped off with ‘Rambutious an amazing jazz fusion band comprised of many degree holding musicians not to mention several music professors. They also did something I have never seen at a live show, taking improvisational requests from the audience, asking for titles to their own songs from random people to use as their thematic muse in making up a song. It was like watching a beautiful birth. As a whole the night was truly inspiring and all the performances were somehow both amazingly chaotic yet exactingly synchronized. Specifically, I will say that all the bands were excellent but Lemon Bucket Orkestra is a band to put on your bucket list.